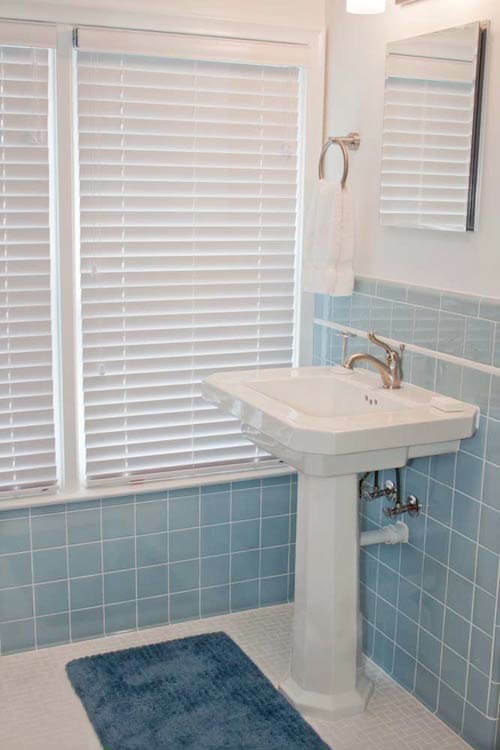 When Readers Matt and Jeff bought their 1952 Cape Cod style house in Plymouth, Michigan, they knew they would have to remodel the second floor master bathroom — which had been “updated” poorly and cheaply by a previous owner — and had become an unusable mess. At first Matt and Jeff didn’t know what to do with their bathroom. They spent six months trying to decide what kind of tile to use, and finally, in frustration, they turned to the internet where they discovered Retro Renovation. They quickly realized that the answer to their bathroom design indecision was not to update — but to Retro Renovate. 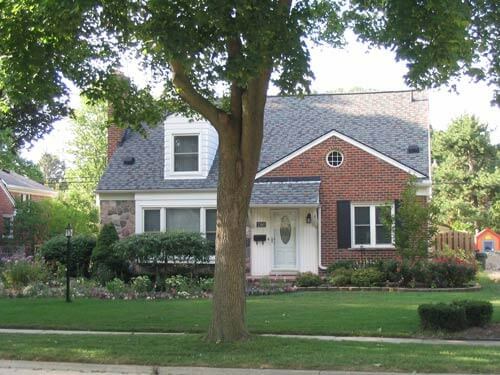 We bought our 1952 Cape Cod style house in Plymouth, Michigan, in March 2006. 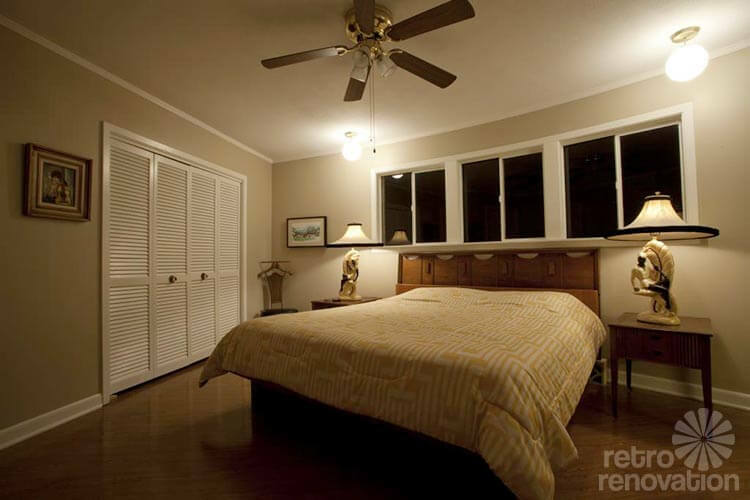 The master bathroom is on the second floor. 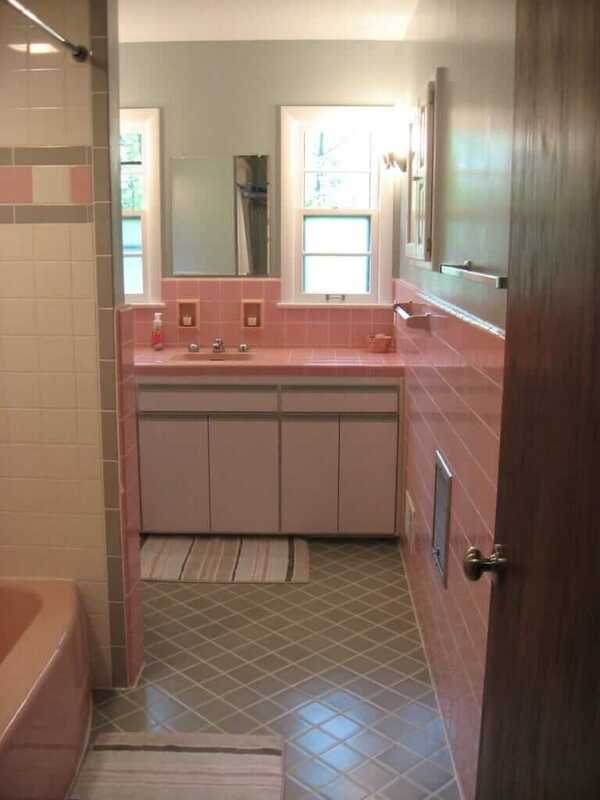 Originally, it had been a very small full bath with a sink, toilet, and tub (pink, I’m told by a previous owner — and later found evidence of — grrrrr), but that was long gone. Instead, somebody along the way decided to expand the bathroom across the entire end of the house. The tub had been removed, and in its place was a $295 Home Depot special corner fiberglass shower, improperly installed and unusable due to leaks. There also was a small pedestal sink… some green vinyl flooring… and unfinished wood trim that nobody ever got around to painting or staining. The floor plan of the expanded bathroom would stay the same, but this time with a larger sink and the addition of cabinet storage, a large walk-in shower, new electrical, proper plumbing, and ventilation. The downstairs bathroom got the remodeling treatment first a few years ago, and we went with the trendier natural stone at the time. So for the master bathroom in 2011, we knew we weren’t going to do that again. Off to the tile store we went, thinking white everything. After literally three or four hours with the tile consultant and becoming increasingly agitated with each other, the only think we could agree upon was that it wouldn’t be white. In searching for other ideas on the internet, I literally chanced upon the Retro Renovation website, and found the photo of the beautiful pink and maroon tile bathroom from B&W tile – that was it! We knew immediately that we should do something that was retro-inspired, period appropriate to the house, but with some modern touches. Over the next couple of months, my contractor and I had several conversations with Debbie at B&W, and we ordered a number of samples. B&W was absolutely great (and competitively priced! 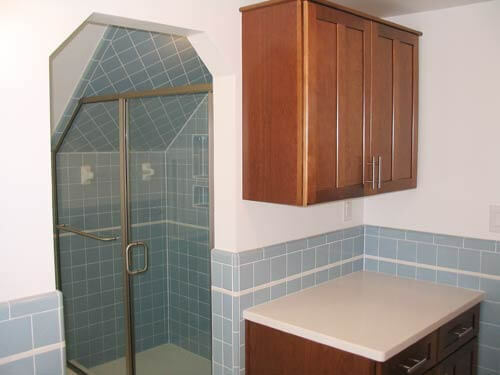 ); however, in the end, we decided to go with a light blue for the field tile on the walls, as there’s been some uncertainty about whether I would be transferred out-of-state, and resale concerns. The bathroom was pretty much a total gut job. It was rebuilt the old fashioned way, with the tile floor and shower pan both mud-set, and full bullnose wainscoting. 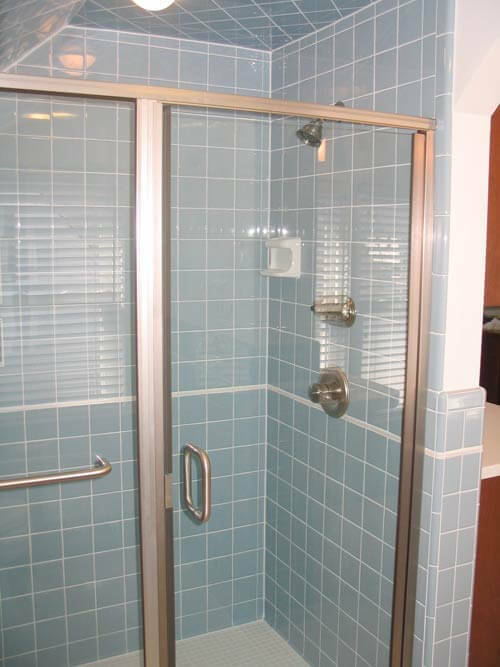 The field tile is Daltile Semi Gloss, Waterfall (0169). Ceramic tile liner, towel bar brackets, and soap dish are Daltile White (K-101, matches Kohler white). Recessed toilet paper holder is from HCP Industries, Model HCP TT66SR, (#13 Tile White, which is a perfect match for the Daltile K-101 color) – I ordered this from Pro-Source Center online. The recessed wall niche in the shower is from Noble Niche (#304). We wanted a blue tile floor (or had we gone with pink field tile, would have wanted a pink floor), but we just couldn’t find anything that would work color-wise in the 10-week window that we had to put the final specs together for our contractor. I talked with Chippy at World of Tile, who sent a few samples of NOS they had, but the colors just weren’t right, so we went with American Olean Chloe, Satin White Pinwheel with Satin White Dot, (CH01). The pedestal sink and toilet are from the Kohler Kathryn Series, and the recessed medicine cabinet is also from Kohler. Faucets and shower fixtures are all from Delta, in the Brilliance Stainless finish. The cabinetry is from Kraftmaid, birch wood, Antique Chocolate with Mocha Glaze stain/finish. Countertop and shower threshold top are Corian, Verano White. The light fixtures are by Sea Gull Lighting – ceiling mounted fixture is from the Eternity Collection, and vanity fixture is from the Winnetka collection. The exhaust vent/heat/light fixture is the Panasonic FV-11VHL2 WhisperWarm. In the end, we are very pleased with the results. The only things I would do differently in the end concern the shower and the exhaust vent light. The shower has a main spray plus a couple spray jets about chest high. Originally, I was going to have an adjustable hand held shower spray as well, but Matt talked me out of that at the time. It sure would have made for easier cleaning! As for the exhaust vent, I told my contractor that I wanted the best vent/light/heater combination unit that was made, to which he said the best in his experience were made by Panasonic. It never occurred to me that it would have fluorescent bulbs, and I hate fluorescent light. Too late now, but if I could do that over again, I’d separate the toilet area light from the exhaust vent. Bravo Matt and Jeff! 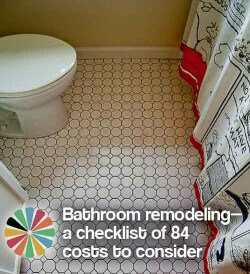 Remodeling a bathroom that has issues concerning its functionality — such as a leaky shower — is always a good move. But you’ve gone above and beyond to renovate your bathroom in a style appropriate to the period of the house — and golly, this bathroom seems nearly Perfect. 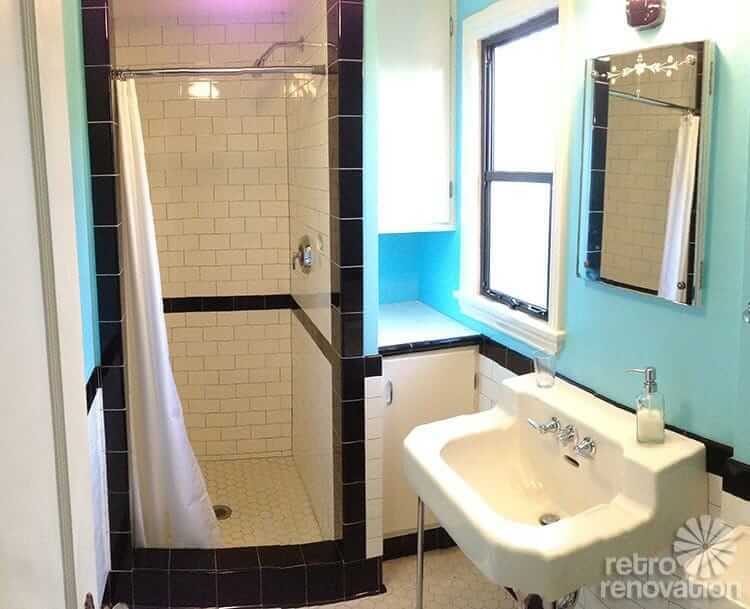 It may not have been quick or easy, but I’m sure you feel it has been well worth it to end up with the beautiful blue bathroom that you have now. I absolutely adore your pedestal sink — and adding the white liner tile on the walls is a great touch to blend the blue and white together. Thanks a bunch for sharing your story and photos of your bathroom remodel with all of us! Pam’s blue bathroom video #2 — Things that turned out really well — See this video for one of Pam’s Big Recommendations that Jeff mentioned: Adding a hand-held shower on a diverter to your tub or shower plumbing when you have the walls out and are able. You did an excellent job from top to bottom! I love the timeless blue you choose. Very inviting. Great job. Love the archways–so many people take them out but they added so much character. Is there a name for that sort of arch? I’m looking at one right now, it connects my dining room to the living room/front door. 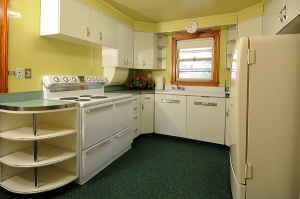 I also live in a 1950s Cape Cod, this was a custom house and it has a few odd, interesting features. Lots of scallop trim, for one thing. You know, I never thought about a name for that type of archway, and I don’t know. They are common in houses of the era around metro Detroit – but not original to this house. Main floor is all wet plaster with cove ceilings and rounded archways between the main living areas, but the second floor had none. This bathroom was originally two rooms, but whoever combined them years ago left nothing between the two walls that divided the new, single room. I wanted something that looked more “finished,” and the lead carpenter had the idea to build what you see in the after photos – probably the best $50 I ever spent, cheapest thing in the whole bathroom, and makes all the difference in the world! I wholeheartedly agree: An awesome detail — and cheap! How often can you say that! If you are good at doing grout… I suggest the epoxy grout. It doesn’t stain and retains its color well. It doesn’t need sealing either. BUT it is hard to install. One has to know what they are doing with it. It has a short set up time and you need to be ready to rock and roll when you install it. 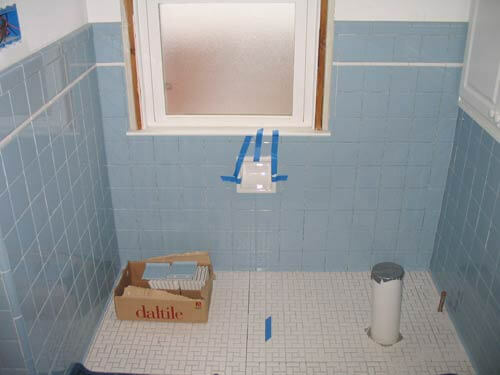 I remember those mosiac tiles and the worst part was grout staining… so I opted for epoxy grout. But I knew what I was in for when I started mixing it.